Beneficiaries: In 2006, the Nguyễn Xuân Quỳnh-VinceWill Education Foundation was opened to help poor children in Bắc Ninh province. Vince Grimm and Will Kratz of Cape May County, New Jersey in the United States, visited Việt Nam as tourists in 2000, and ended up making friends with their tour guide. The connection led to an educational foundation supporting fatherless and poor children in a country more than 10,000 kilometgres away. In 2000, Grimm and Kratz were on a tour that included Việt Nam, Cambodia, and Laos. Along the way, they got to know their tour guide, Nguyễn Xuân Quỳnh. Once in the north, Quỳnh invited the pair to his home to meet his family and to show him around, taking them off the established tour routes. They kept in touch and the following year Grimm and Kratz returned for six weeks and again used Quỳnh as their tour guide.This time they visited a small village called Lim in Bắc Ninh Province, located about an hour outside Hà Nội. 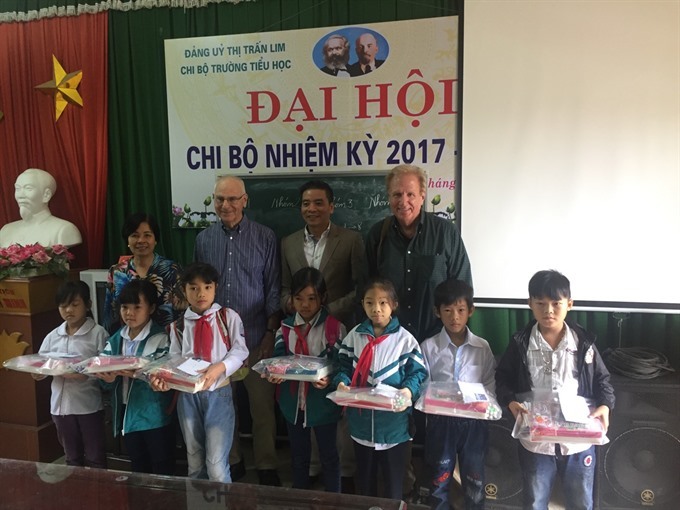 It motivated Grimm and Kratz to start an educational foundation to help childens living in Lim town in Tiên Du district in Bắc Ninh province. With Quỳnh’s help in administrative procedures, they set up the foundation on the Việt Nam side to help poor children in Bắc Ninh province. In 2006, the Nguyễn Xuân Quỳnh-VinceWill Education Foundation was officially established. Grimm said no money goes to the children – they receive school supplies, school jackets. The exception to the no-money policy is when kids are at the top of their class, when they get “a couple dollars” as a reward. “Our goal is education for these fatherless and poor children. This way we are making future friends for America,” he said. “ On our fourth trip to Việt Nam we came to the school in Lim and saw the children. We toured the classrooms and met guyễn Kim Thịnh, retired deputy principal of the Lim elementary school. We asked what we could do to help the children. It was revealed that the students required extra help. We agreed to a plan to assist them, ” said Vince Grimm. “We went back to America to establish a legal foundation. We returned to Việt Nam to establish the help and enter into agreements with the Lim district officials,” he said. This foundation is a certified non-profit organisation approved by the US tax code. We have a board of directors consisting of a president, Vince Grimm; vice-president, Nguyễn Xuân Quỳnh; treasurer, Craig van Baal; and Secretary David Volk. Vince is a retired technical engineer with 40 years experience. Will Kratz was an award winning professional executive chef. He died recently. “We offer help to university students from Lim also as well as secondary school students," said Vince. The money come from generous and caring Americans and Vietnamese and from Vince Grimm and Will Kratz. After 10 years, more than 200 students have benefited from the fund. 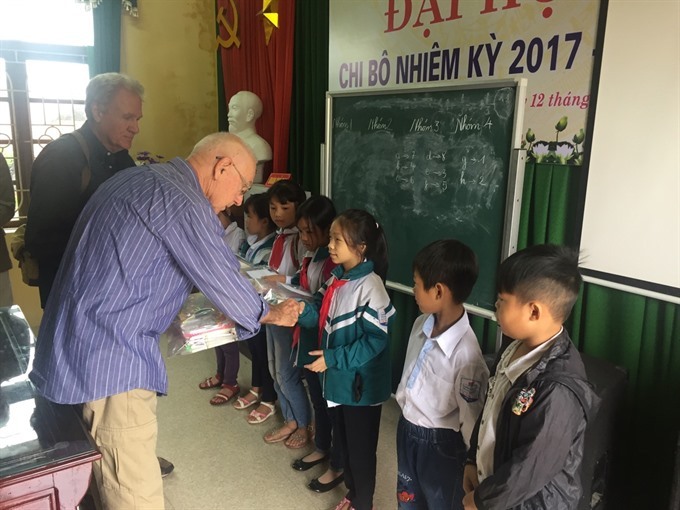 The American duo arrive in Việt Nam at least every other year to meet the students. “We have no difficulties in running this foundation, thanks to the co-operation of the schools, village and the wonderful teachers, Vince said. Besides they also helped children in other remote regions of Việt Nam, helped blind people in Hà Nội, farmers who tried hard to help their children and students in their studies. Chu Thị Lan, rector of Lim secondary school in Lim town said: “We appreciate the generous help of the foundation. It helped our students by offering books, pens, and other school supplies. The school also got computers and projector from the foundation. It’s an important encouragement to their studies. The pupils are very happy”. Nguyễn Văn Lâm, head of Duệ Đông village of Lim town , said: “The activities of the foundation have had a very positive impact to our village. Our poor students from primary to high school get support, so it motivates them to try harder in their studies.